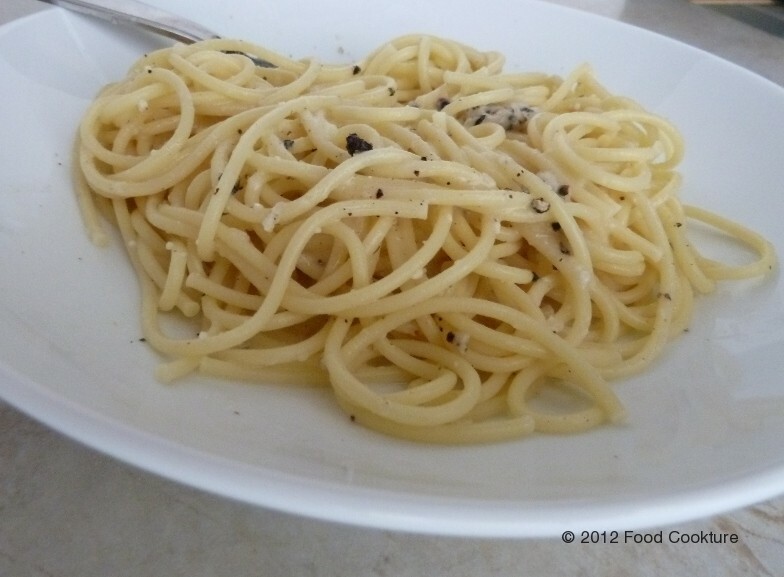 Spaghetti cacio e pepe’s simplicity will surprise you. Its sauce, as the name suggests, is made only with cacio (cheese), pepe (black pepper), and the addition of pasta water to make it creamy. I first saw this pasta recipe when watching Anthony Bourdain’s television show No Reservations when he visited Rome, Italy. 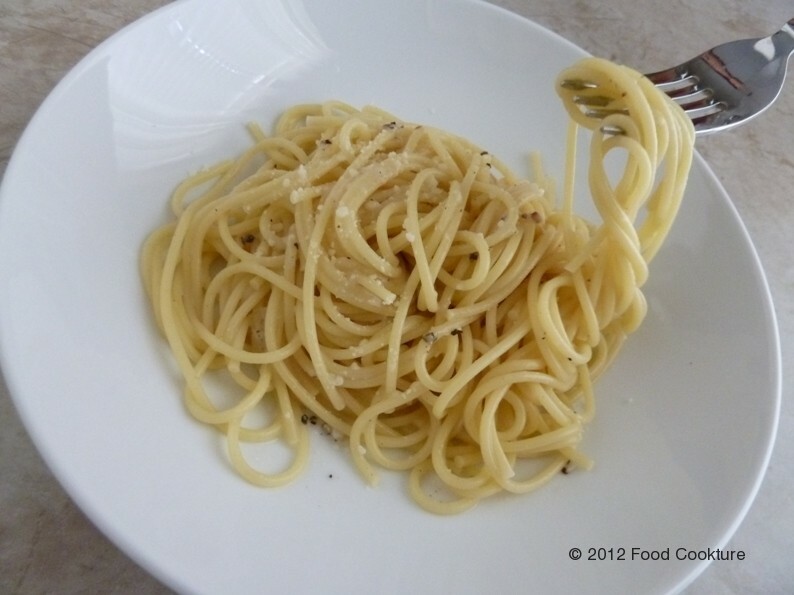 As soon as the episode was over I was in my kitchen making my own version of spaghetti cacio e pepe. Fortunately I always have a variety of cheeses at home (one of my addictions) and Pecorino Romano happens to be one of them. I immediately made myself a serving and was delighted by the minimalism of the dish and amazed at the intensity of flavors created by only two ingredients. The cheese combined with the hot starchy pasta water produces a light creamy sauce without the need to add cream, butter or oil. The freshly crushed black peppercorns give a wonderful aroma and also provide some earthy heat to the dish. Ideally, if you can find it, the recipe is named after “Cacio di Roma” which is a semi-firm textured cheese from the region of Lazio, Italy. But Pecorino Romano is a perfect substitute. Some recipes use additional butter and/or olive oil, but I don’t see a need and would rather make this dish lighter without them. I also don’t add extra salt since the Pecorino Romano cheese has just enough to offer the dish. Be prepared to get addicted, it is delicious and is made in less time than it takes to cook the spaghetti. Plus, this is probably the easiest pasta you will ever make and I’m sure will also become one of your favorites. *NOTE: These are approximate amounts. I must admit, when I make this recipe I sometimes change the proportion listed here. Sometimes I want more cheese, other times more pepper. So feel free to taste and add more as you go. You can add a bit more of each after you toss the pasta together. Cook spaghetti in boiling water with salt for 8 minutes until al dente (cook 1 minute under the package instructions for “al dente” pasta). Wait until water reaches a rolling boil before placing pasta for it not to stick together. Grate the cheese and set aside in a bowl. 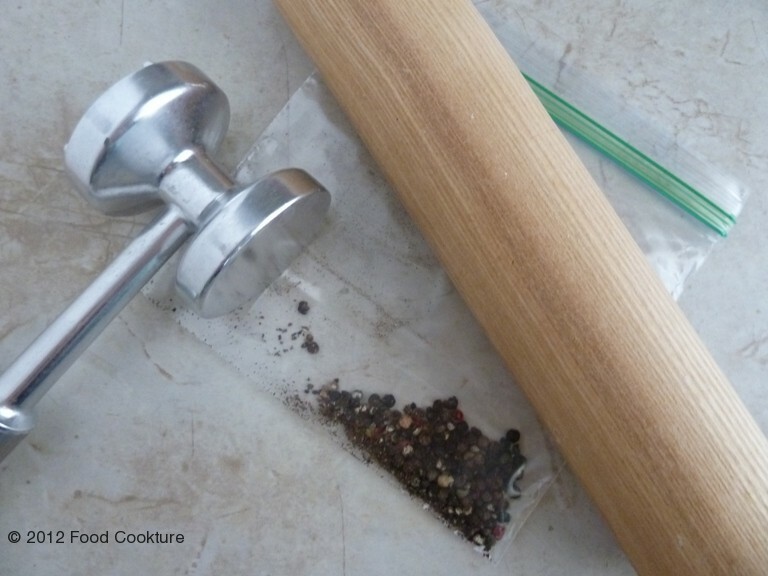 Crush the black peppercorn using a mortar and pestle, or place peppercorns in a small plastic bag and crush using rolling pin (roll over peppercorns) or a meat tenderizer (make sure to use a cutting board or protective surface underneath). 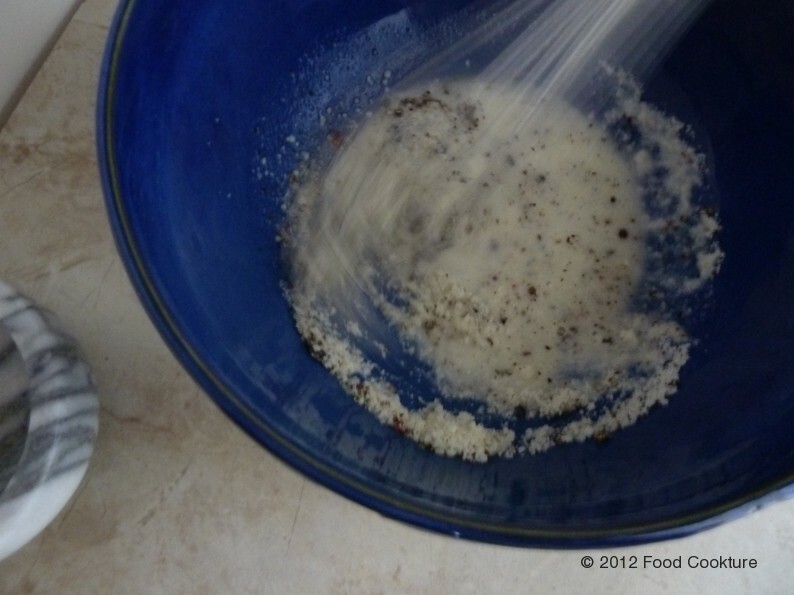 The crushed peppercorns might pierce through the bag, so you can also cover the bag with a dish towel. 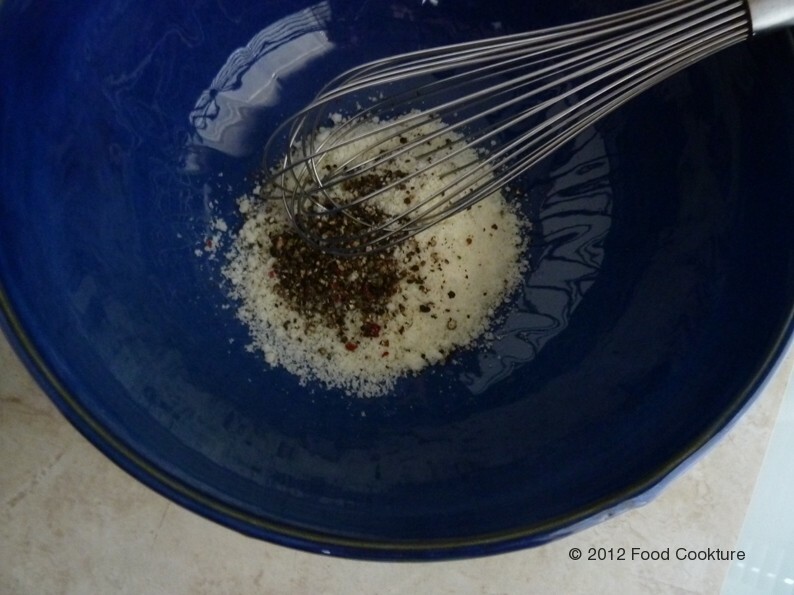 Place the crushed peppercorns in the same bowl with the grated cheese. After cooking the pasta for approximately 5-6 minutes (when the water is no longer clear); add approximately 1 cup of the pasta water to the bowl with cheese and pepper and whisk until a creamy sauce is formed. This is your “cacio e pepe” sauce. Once the pasta is cooked, drain pasta (reserving the pasta water in case more is needed for the sauce). 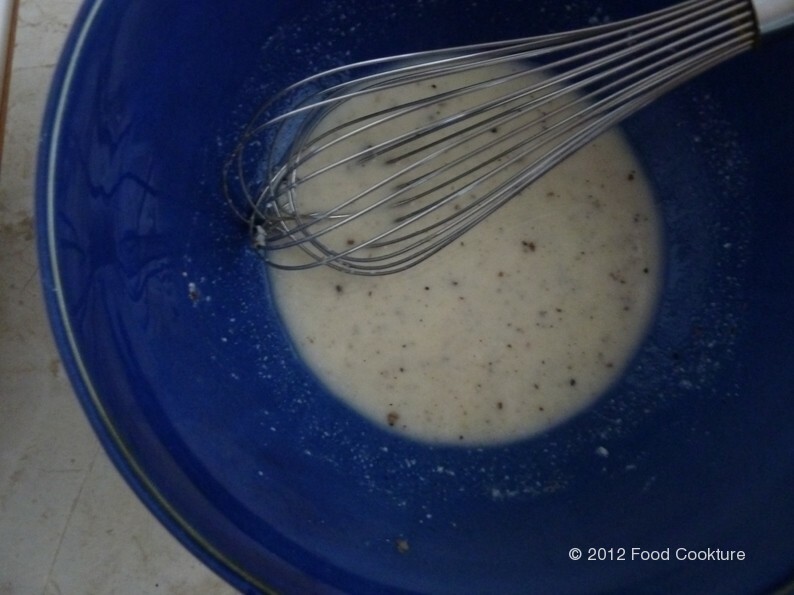 Add the pasta to the bowl with the cacio e pepe sauce and toss until the pasta is well coated with the sauce. Add more pasta water if needed and more cheese and/or pepper to your liking and toss again. I hope you enjoy one of my favorite (and fastest) pasta recipes! This entry was posted in Entree (lunch/dinner), First Course, Pasta, Vegetarian and tagged black pepper, cacio, cacio di roma, cheese, easy recipe, easy recipes, formaggio, italian recipe, pasta, pecorino, pecorino romano, pepe, pepper, peppercorn, peppercorns, roman dishes, simple dishes, spaghetti, spaghetti cacio e pepe, spagueti, vegetarian. Bookmark the permalink. You should have seen my face when I saw this recipe in your blog! :) I absolutely love it! Simple and delicious! :-) I’m glad you liked the post… because I know how much you like this pasta :-) enjoy! YUM! I have 2/3 kids who love pasta but hate tomato sauce. They will love this! Glad you like it! I hope they do as well :) I think this will become your favorite since the sauce is done in one minute! :) you can use ground pepper so it’s not too strong for your kids :) enjoy!